The silence here is very indicative of how we’re feeling. We’ve been mostly staying with my parents, punctuated with shorter stays with various other family and friends. It’s lovely to catch up with people, to sit on sofas, have baths, cook in kitchens, sleep in beds, have access to all our belongings (although remember we did declutter to a fairly extreme degree this time last year so ‘all our belongings’ is still a fairly small heap! ), plug things in whenever we feel like it, be able to ‘pop’ to the supermarket open all hours across the road. But it’s also fairly stifling. There I said it! We find the constant hum of traffic noisy, smelly, distracting and disturbing. The constant drone of the television with it’s endless rounds of repeats and rubbish and adverts bleak and depressing. The waste of time and money and food caused by that very supermarket punting out cheap food at all hours which is supposed to free people of time and money. I am not sitting in judgement of the way our family and friends live their lives. For the first 30 odd years (for me, 40 odd for Ady) we lived ours just the same and we felt fulfilled and happy almost all of the time. But now the four of us are hankering after those days we spent this year engaged in collecting and chopping firewood, sowing, harvesting or preserving foods, baking bread, fishing for our tea, looking out of our window and seeing the sun rise and set, or the rain tip from the sky and our beautiful world going by. In lots of ways although we are finding elements of this period a challenge that reassures us that our future plans are right. That we won’t be missing these aspects of our old life once we don’t have access to them any more. That the simpler lifestyle we spent so much of this year living and enjoying is indeed the right one for us. Hand on heart we can all say that we didn’t hanker after Sussex or central heating, or 24 hour Tescos or pre-packaged pasta sauce or indeed any of the things we are kissing goodbye to when we embark on the next step of our journey. It’s been a good test to have access to all these things again just to see how we felt about them. We visited Willow on Christmas Eve, just a fleeting pop in to collect something we’d left in one of the cupboards. It felt like a real wrench to lock the door and drive away from her again though. As lovely as spending time with family is I think all four of us would have been very happy to wake up in Willow on Christmas morning and have a go at cooking a turkey in our little oven. So as 2011 draws to a close we are able to know for sure that we have had an amazing adventure this year and are more than ready to set off on the next one, knowing for certain that we simply don’t belong here any more. Sorry for the silence. It’s been a constant round of catching up with family and friends, doing festive stuff and also putting the first touches to our What Happens Next plans. I’ll talk about that a bit more once we actually know whether our hopes are to be realised as for now that is out of our hands with other people making the next decision. I’ll update as soon as we know what our next move is to be but for now I’d like to share a newspaper story that appeared about us in the Scotsman, which will also spill the beans about what we’d really love to be our next move. THEY went in search of the Good Life and believe they have found it on a remote Scottish island. After nine months of travelling the country in a 30-year-old campervan, working on farms and crofts, the family from Sussex are ready to put down roots and have set their hearts on becoming nearly a tenth of the population of Rum. 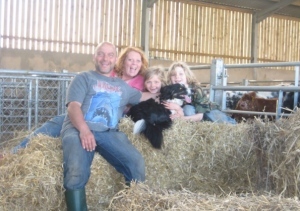 Ady, 47, his wife Nic, 38, and children Dragon, 11 and Star, nine, have applied for one of the first crofts created on the island after living an “off grid” lifestyle, travelling across the UK in an activity known as WWOOFing (Willing Workers On Organic Farms), using a network of hosts to facilitate placements on organic farms. The family recently visited Skye and the community-owned island of Eigg where they learned islanders on Rum were offering new croftland to help increase the population and stimulate the economy. The Goddards are now among those whose applications will be considered by tomorrow’s closing date with potential crofters due to be interviewed in January or February. The crofts have also attracted inquiries from Edinburgh and even the Czech Republic, as well as existing islanders, despite being little more than rough ground at present. Nic, who previously worked in retail management and marketing, said: “I believe everything we have been doing over the last year has been leading up to this. “Over the last ten years we have been moving away from conventional life towards self sufficiency. We had ideas of an idyllic life but we wanted to see for ourselves what it would be like so we could go into it with our eyes open. She said the family also like the idea of being part of a population that makes its own decisions. While most of Rum is owned by Scottish Natural Heritage, the village of Kinloch is run by the Isle of Rum Community Trust on behalf of the 38-strong population. She added: “We have learnt so much this year about living off the land. We know what the important things are to consider when looking at land, what crops are worth growing, which animals are worth keeping. We have practical skills such as fencing, building, growing. We have vastly extended our knowledge base on animal keeping, harvesting, tending to livestock and crops. The two crofts on offer are located to the west of Kinloch and the trust admits they will both require a “significant amount of work” to improve he area beyond rough grazing. Vikki Trelfer, Rum’s development officer, said the trust has a vision for the island as a vibrant and viable community for people of all ages and a sustainable and diverse economy. She said new residents with children would help to keep the school open. At present there is only one P7 pupil in the school, one three-year-old in the nursery, and two children under three, while three teenagers go to secondary school in Mallaig. “New residents will bring different skills and expertise to assist development of the community on Rum. Also, there are a number of opportunities for providing visitor services on the island in the private sector,” she said. The only other croft has already been let to Rum residents. Feel free to play your own hold music! We’re currently staying mostly at my parents house back in Sussex. I say mostly because although we’ve been back in Sussex for a couple of weeks we have had various overnight stays with other family and friends scattered around and this coming week we’re off again for 10 days. It’s lovely to catch up with family and friends properly, to take some time to look back at photos of our adventure and start to turn some of the stories of our adventures into memories and anecdotes, looking back fondly on even the challenging bits. It’s nice to have electricity at the flick of a switch, hot water whenever we want it, access to a washing machine, a bath, our own bed and most of our possessions which have been stored here for us. It’s also incredibly stifling and in many ways far more challenging than WWOOFing, staying with hosts or living in a campervan. Which is no reflection on my parents or indeed where they live, but a very telling indicator of how much we have changed. It was a concern of ours that once we returned to a ‘normal’ setting we would not want to leave it again, that the things we were so adamant we had not missed would infact remind us of how wonderful they were and make us feel we’d never want to leave again. Instead we are reminded daily of how much freer and happier we felt during this year. How much we loved the lack of traffic and people and bustle. How the convenience of a supermarket does not make up for the fact trees were chopped down to build the carpark. That the downside of a sofa and a TV is feeling unfit and unhealthy slumped on one infront of the other. All four of us are missing the lifestyle we led this year and are enjoying this period as a brief reminder of what we left behind and why it’s just not right for us any more. It feels rather strange not to be working in some capacity – either as paid employees or as WWOOFers but we have certainly been busy. We had so many things to catch up on: Doctors, dentists, opticians, blood donor appointments all round for routine medical maintenance. We had to empty out Willow, give her a really good clean, declare her SORN and leave her put to bed for now, resting on a friend’s land until such time as she is called back into service again. We bought my car back out of retirement and had to do the reverse exercise with that; Tax, insurance, MOT, bit of mechanical attention from the time off road and get used to driving something smaller and with gears again. We had various financial things to put in order and paperwork to file. Finally we have given our tenants their two month notice and had an estate agent visit the house to value it and begin the proceedings for putting it on the market. It’s a strange sort of limbo period, not helped by it being so close to Christmas which is always chaotic and frantic for everyone anyway. For us, it is a time of biding our time, finalising our plans for what happens next and working on a new set of dreams and hopes and ideas. All very exciting and hopefully soon to be shared on here but for now, maybe listen to a bit of festive music while we’re on hold.